Excellent info on hormones in this book: What your doctor may not tell you about Menopause, John R. Lee MD. Also a good book of his is “Hormone balance made simple” about HRT. There’s also his site, but if you really want to look into HRT, buy his books. Books from John R. Lee, MD are very good and practical on this subject. When for some reason most of your progesterone is turned into cortisol, that’s what’s called pregnenolone steal. It is represented by the small arrows leading away from pregnenolone. When this happens, a big part of your pregnenolone and progesterone is turned into cortisol and there’s little left for the other hormones. This leaves you with a hormone imbalance. Low blood sugar raises cortisol. This triggers the release of stored sugar stores (glycogene) so blood sugar levels can rise. So if you want your cortisol to remain low, make sure your blood sugar levels are right. Stress raises cortisol. But sometimes stress is just inevitable. 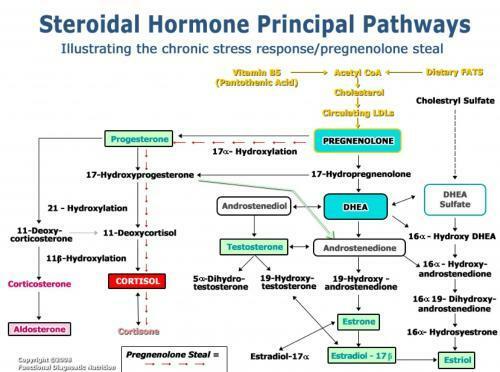 High cortisol means that pregnenolone and progesterone are mostly turned into cortisol => lower progesterone levels. 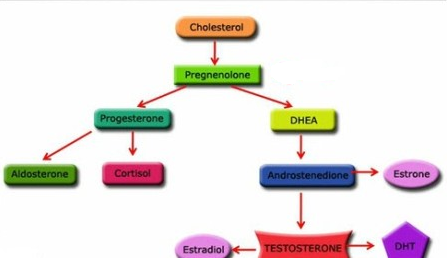 You need progesterone to oppose estrogen. Constantly low progesterone leaves you vulnerable to estrogen dominance. You’re going to be low in DHEA, testosterone, aldosterone and other hormones. A small silver lining here is that estrogen will go down as well, so you need less progesterone to oppose it. But environmental estrogen (soy products for instance and plastics) could get the upper hand. Too much cortisol, again caused by the adrenal glands’ response to excessive stressors, causes the tissues to no longer respond to the thyroid hormone signal. It creates a condition of thyroid resistance, meaning that thyroid hormone levels can be normal, but tissues fail to respond as efficiently to the thyroid signal. This resistance to the thyroid hormone signal caused by high cortisol is not just restricted to thyroid hormone but applies to all other hormones such as insulin, progesterone, estrogens, testosterone, and even cortisol itself. When cortisol gets too high, you start getting resistance from the hormone receptors, and it requires more hormones to create the same effect. That’s why chronic stress, which elevates cortisol levels, makes you feel so rotten—none of the hormones are allowed to work at optimal levels.